As you may already be aware, recently I’ve been thinking alot about sewing with my existing stash of fabric rather than buying more, and I’ve been trying to encourage others to do the same. Tackling the larger pieces of 2 metres-plus is proving easy enough, but so much of my stash seems to be comprised of smaller lengths and nice largish scraps. I’ve been thinking of ways sewers can use these stash-fillers in garment making projects and I plan to share some ideas with you over a series of posts. Taking a look at some garments I had previously made I remembered two ways you could use smaller pieces of fabric to create a fun contrast. Skirt and trouser facings, or inner waistbands depending on the style, look much more interesting when made from a sweet check or ditsy print. This works best when you’re sure it won’t peak out and become visible from the outside. Similarly, pocket bags can be made from an alternative fabric. It’s often better to use a lighter weight fabric rather than the main outer fabric for pocket bags anyway, so why not use something cute? As long as you create a facing for the pocket mouth in the main outer fabric, the rest of the pocket can be as crazy as you fancy! As I’m sure you are aware, these kinds of contrasts can often be found in manufactured garments, but usually only in more expensive lines, as cheaper clothing producers cut costs as much as possible by avoiding costly unnecessary internal details like this. With all the love, time and effort that goes into sewing clothes by hand, why not take an extra step to make your creation even more different and special? What I love the most about contrast internal details, like nicely finished seams, is the buzz I get when put the garment on and I see them. They are a pretty secret added just for my enjoyment, with no practical purpose other than to make me smile! Have you used contrast fabric as a ‘secret’ detail before? I would love to hear how. Friday chatter: Do you fear ruining fabric? I always use random printed fabrics to replace the pockets on my jeans. (Brief version of my rant: Why is it assumed women only want 3 inches of pocket space in their pants?) The jeans I had on yesterday had little gnomes on the pockets. It’s a nice little day-brightener and the way I attach them I’m the only one who sees the fabric. 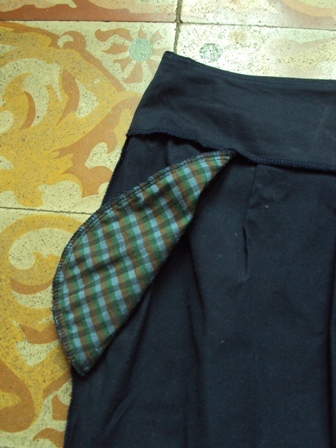 I like using small pieces of contrasting fabric to back inverted pleats on skirts. It’s fun having a little bit of colour peak out when you move. I use scraps for little details a lot too. For example, I replaced the facings in a little shirt for my youngest with a fun fabric and it looked really cute. 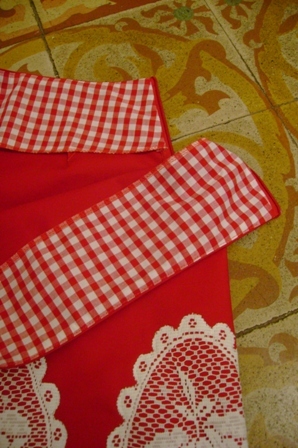 The insedes of the pockets is another good example too, and ofcourse there is always the possibility of appliques etc. Good idea… I save most of my scraps and this will be a good way to use them. Thanks! Great ideas. I hate throwing away all the small pieces of excess fabric. Recently, after one year of gathering scraps from my sewing ventures, I have decided to put them to the cutting and sewing table. The goal is to lay them all side by side and make one large fabric to then use with patterns again and create blastingly crazy underthings. I keep scraps to remind me of the process and to build a less wasteful lifestyle. We will see what exactly and how exactly to sew them together. Thank you for this reminder post!